Kaiser Permanente provides its residents and fellows with a compensation program that is highly competitive in today’s market. We approach salary and benefits as a total compensation package: wage programs, pay practices, paid time off, educational leave, and ancillary benefits such as child and elder care, are all part of a compensation structure that sustains a comfortable quality of life for our residents and fellows. Our excellent comprehensive medical plan includes prescriptions and is provided at minimal cost to you and your dependents. Specific information about your coverage is available when you visit. There are six paid holidays per year. Each year you receive three weeks of paid vacation and one week of paid educational time per program approval. 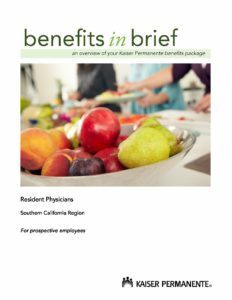 As a Kaiser Permanente resident and fellow you are eligible for reimbursement for the following educational and license fees incurred while completing your residency with us. Each year you are also eligible to receive a $500 reimbursable allowance for educational materials. In the final year of training residents can receive a week of leave and $1,000 professional conference allowance. Your Program Director will discuss how to qualify for reimbursement. Sick leave is provided. Short-term disability insurance is avail­able for a nominal charge through payroll deduction. A parental leave policy has been established. Medical malpractice insurance is provided for you by the Southern California Permanente Medical Group. A meal allowance is provided which covers the cost of most meals. Both are provided for you at our expense. Private rooms are provided when you are on call. Licensed residents can earn additional income with moonlight­ing opportunities available within our medical center with approval by the Program Director.